Home » Why combine a business mastermind with ayahuasca? 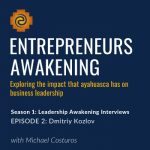 I get asked this a lot when I speak about Entrepreneurs Awakening. The unique combination of bonding while traveling, exploring new territory (internally and externally) and having the support of a business mastermind before, during and after the experience has helped dozens of founders and entrepreneurs revolutionize their companies over the years. It’s the transformations that I witness that drives me to lead these masterminds, year after year. In this video, I explain exactly what happens in the mastermind–before, during and after–and how these are specifically created and curated for business executives and entrepreneurs. I don’t know of any other business mastermind designed in this way, and here’s why I think it’s so effective.